#Energy: "Nanotech T-Shirts to Charge Cell Phones"
Xiaodong Li (foreground) demonstrates the flexibility of a swatch of activated carbon textile. Here is what University of South Carolina says about fabric super capacitors: Over the years, the telephone has gone mobile, from the house to the car to the pocket. 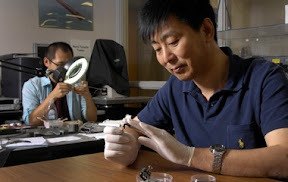 The University of South Carolina's Xiaodong Li envisions even further integration of the cell phone – and just about every electronic gadget, for that matter – into our lives. He sees a future where electronics are part of our wardrobe. "We wear fabric every day," said Li, a professor of mechanical engineering at USC. "One day our cotton T-shirts could have more functions; for example, a flexible energy storage device that could charge your cell phone or your iPad." Li is helping make the vision a reality. He and post-doctoral associate Lihong Bao have just reported in the journal Advanced Materials how to turn the material in a cotton T-shirt into a source of electrical power. Starting with a T-shirt from a local discount store, Li's team soaked it in a solution of fluoride, dried it and baked it at high temperature. They excluded oxygen in the oven to prevent the material from charring or simply combusting. "We will soon see roll-up cell phones and laptop computers on the market," Li said. "But a flexible energy storage device is needed to make this possible." The once-cotton T-shirt proved to be a repository for electricity. By using small swatches of the fabric as an electrode, the researchers showed that the flexible material, which Li's team terms activated carbon textile, acts as a capacitor. Capacitors are components of nearly every electronic device on the market, and they have the ability to store electrical charge. Moreover, Li reports that activated carbon textile acts like double-layer capacitors, which are also called a supercapacitors because they can have particularly high energy storage densities. But Li and Bao took the material even further than that. They then coated the individual fibers in the activated carbon textile with “nanoflowers” of manganese oxide. 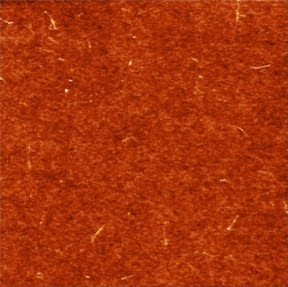 Just a nanometer thick, this layer of manganese oxide greatly enhanced the electrode performance of the fabric. "This created a stable, high-performing supercapacitor," said Li. This hybrid fabric, in which the activated carbon textile fibers are coated with nanostructured manganese oxide, improved the energy storage capability beyond the activated carbon textile alone. The hybrid supercapacitors were resilient: even after thousands of charge-discharge cycles, performance didn't diminish more than 5 percent. "By stacking these supercapacitors up, we should be able to charge portable electronic devices such as cell phones," Li said. Li is particularly pleased to have improved on the means by which activated carbon fibers are usually obtained. "Previous methods used oil or environmentally unfriendly chemicals as starting materials," he said. "Those processes are complicated and produce harmful side products. 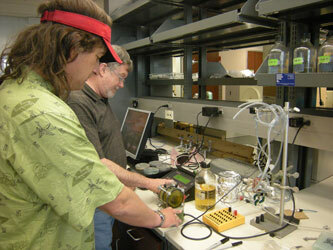 Our method is a very inexpensive, green process." Here is what ABI Research says about tablets challenging iPad: Microsoft may face an uphill battle by throwing its hat into the mobile computing tablet ring. Windows is expected to account for only 1.3% of media tablet shipments in 2012. It assumes that the popularity of Windows for PCs is a draw for Windows on tablets. 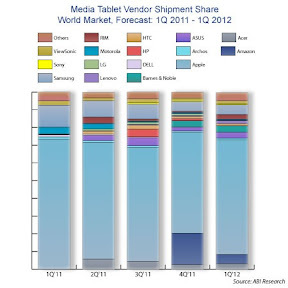 ABI Research expects Windows 7, Windows 8 and Windows RT-based tablets to account for only 1.3% of 2012 global shipments; having little impact on the market this year. This is due to lack of adoption for Windows 7, but primarily due to the late-in-year launches of Windows RT and Windows 8 operating systems (estimated to become commercially available in select devices starting in October 2012). The obvious “low hanging” market opportunity for Microsoft’s Surface tablets is with business buyers that have an installed base of Windows PCs. Is Microsoft suggesting that organizations will make the “post-PC era” move toward a mobile computing device and ditch traditional desktop and clamshell form-factors, or is the company hoping that employees will gain access to multiple devices? So far, businesses have been opposed to buying incremental computing assets for users due to the support costs. Here is what EETimes says about solid-state quantum computers: Separate labs in the U.S. and Europe recently reported progress in adapting solid-state materials to store spintronic quantum states, a critical hurdle on the path to using spintronics in quantum computing. Many researchers believe that spintronics for quantum computing is the most promising way forward for future computer chips, but few have reliably cast them into solid-state materials. Unfortunately, the most successful experiments today use ultra-cold gases to store quantum spin-states. However, semiconductor R&D labs worldwide are aiming to recast spintronics into traditional solid-state materials. 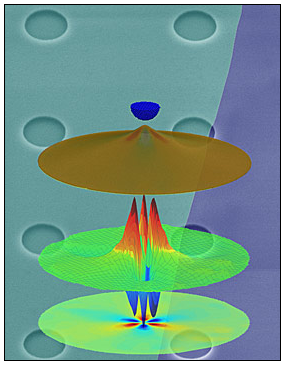 Researchers at the City College of New York (CCNY) and the University of California-Berkeley (UCB) reported success using laser light to encode the spin-state of atomic nuclei on gallium arsenide chips. Using a technique whereby a scanning laser defines the spin-states on a gallium arsenide chip, the researchers claim they can set-up the initial conditions for a quantum computation that can be quickly reconfigured after completion. 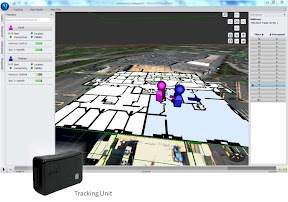 Here is what Neon says about its personnel tracking technology: TRX Systems, an award winning developer of indoor location systems, demonstrated NEON – a new personnel location system that locates and tracks personnel operating indoors and in urban areas where GPS is unavailable or unreliable. NEON greatly improves situational awareness and command effectiveness through the use of advanced sensor fusion, time of flight ranging, and mapping algorithms that deliver precise, real time location of personnel indoors. Uniquely, NEON delivers indoor location without requiring pre-existing or networked infrastructure. NEON meets the requirements for event security, training, and other mission-essential applications requiring a highly portable system that can deliver precision indoor location. TRX demonstrated at the 2012 Joint Navigation Conference in a live presentation of the system’s indoor location and tracking capabilities. Effective After Action Review - Location and status logging for all personnel supporting training and after action review of events. Wearing NEON Tracking Units, personnel are located as they walk, crawl, use stairs and take elevators inside buildings where GPS is not available, and in outdoor urban centers where GPS is unreliable. The real time status of personnel is communicated back to NEON Command Software via cellular, Wi-Fi, or radio networks. Information from MEMS inertial, magnetic, pressure and time of flight-based RF ranging is combined in NEON to deliver precise indoor location information. Neon uses location information to infer site maps dynamically as people move about an area or building. An advanced graphical user interface presents all NEON derived information in an intuitive and effective display to provide comprehensive up to the second situational awareness. The NEON extensible architecture also supports enhanced navigation precision with the addition of rapidly deployable fixed-position nodes. These optional Multi-Sensor Anchor Nodes are small, light weight and may be distributed prior to events in fixed site applications with minimal time and effort. The portability of the NEON system makes it ideal for training exercises, event security, and enterprise deployments where networked infrastructure can be difficult or expensive to obtain. The NEON sensor and mapping technologies are part of the growing indoor location market segment – using motion sensing and RF technologies to augment GPS, Wi-Fi, and other fixed references in buildings and urban areas. “The commercial implications of indoor positioning are even bigger than the commercial aspects of GPS on mobile in recent years” said Bruce Krulwich, author of Grizzly Analytics's report Indoor Location Positioning: Research Pipelines, Start-Ups and Predictions." #SECURITY: "App for First Responders Tracks Carnage"
Here is what the ARA says about the FiRST app: At approximately 6:30 pm on Saturday, May 1, 2010, a smoking SUV in Times Square was reported by alert street vendors. Acting quickly, NYPD evacuated vast stretches on 7th and 8th Avenues, including Broadway theatres and several other buildings and hotels in the area. The entire area was barricaded. Times Square on a Saturday evening before the shows is teaming with people, and the terrorist knew that. The bomb failed, but had it detonated, it would have killed and wounded many, according to NYPD. In the first chaotic moments after suspicion of a bomb threat, first responders have a myriad of questions, assessments, and decisions to make, all at once, and all the while the scene could be changing rapidly. Is the bomb real? How large is the potential blast radius? Where will we evacuate people? Are there any critical infrastructure or special-needs population centers in the vicinity? Any schools, hospitals nearby? What roads should be closed? Which roads should stay open for evacuees? And on and on. What if they could get all this information in one place? Now they can: The U.S. Department of Homeland Security’s (DHS) Science and Technology Directorate (S&T) and its public and private sector partners have developed a must-have “app”: the First Responder Support Tools (FiRST) for computers and smartphones. The FiRST application was developed in partnership with the DHS National Protection and Programs Directorate’s (NPPD) Office of Infrastructure Protection (IP) along with its Office for Bombing Prevention (OBP), and Applied Research Associates, Inc. (ARA). 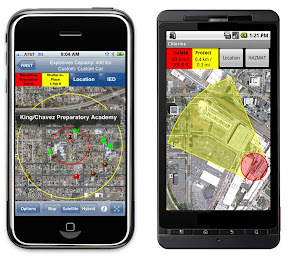 The FiRST app provides information directly to first responders on their smartphones or laptop computers in order to quickly define safe distances to cordon-off around a potential bomb location, calculate rough damage and injury contours, suggest appropriate roadblocks, determine when mandatory evacuation or shelter-in-place circumstances apply, and to identify nearby areas of particular concern: schools, hospitals, care centers. The application also provides the geospatial information with regards to potential injury, glass, or structural damage impact area. FiRST is available to first responders for a nominal fee (about $12 for mobile devices and $100 for Window PC version). The app will be of interest and applicable to anyone who might need to address a potential bomb or HAZMAT spill response, such as industry, HAZMAT transport, or security personnel. HAZMAT information is available to all users. Once a first responder enters a general definition and location of the bomb or HAZMAT incident into the FiRST app, the results are instantaneous. They can run a roadblock analysis to identify which roads are best suited for closure in order to isolate a bomb threat within that specific region. Google Search features are available to identify and display locations where increased numbers of the public may be at potential risk. “FiRST allows responders to label a map with critical information, and this information not only helps first responders better understand an incident, but these maps can then be shared with other responders,” said Jerrett. Users can quickly send results to colleagues via email, which includes a text summary, a map image, and GIS file attachments that are viewable in applications like Google Earth or WebEOC®. The FiRST app is available for iPhones and iPads, Androids, and Windows personal computers. 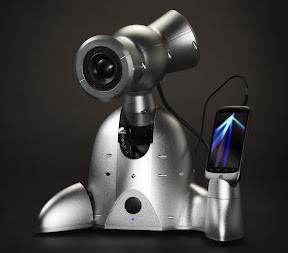 The application is available for purchase at a nominal fee on iTunes, the Google Play, and ARA’s e-commerce website (www.ara.com/products/first). #QUANTUM: "Strained All-Carbon Graphene Mimics Semiconductor"
NIST researchers showed that straining graphene membrane creates pseudomagnetic fields that confines the graphene's electrons and creates quantized quantum dot-like energy levels. The background is a false color image of the graphene drumheads made from a single layer of graphene over 1 micron-sized pits etched in a silicon dioxide substrate. Here is what NIST says about straining grapheme to make quantum dots: Tightening or relaxing the tension on a drumhead will change the way the drum sounds. The same goes for drumheads made from graphene, only instead of changing the sound, stretching graphene has a profound effect on the material's electrical properties. Researchers working at the National Institute of Standards and Technology (NIST) and the University of Maryland have shown that subjecting graphene to mechanical strain can mimic the effects of magnetic fields and create a quantum dot, an exotic type of semiconductor with a wide range of potential uses in electronic devices. Graphene is a single layer of carbon atoms arranged in a honeycomb lattice. Able to conduct electricity with little resistance at room temperature, graphene is a prime candidate for applications ranging from flexible displays to high-speed transistors. 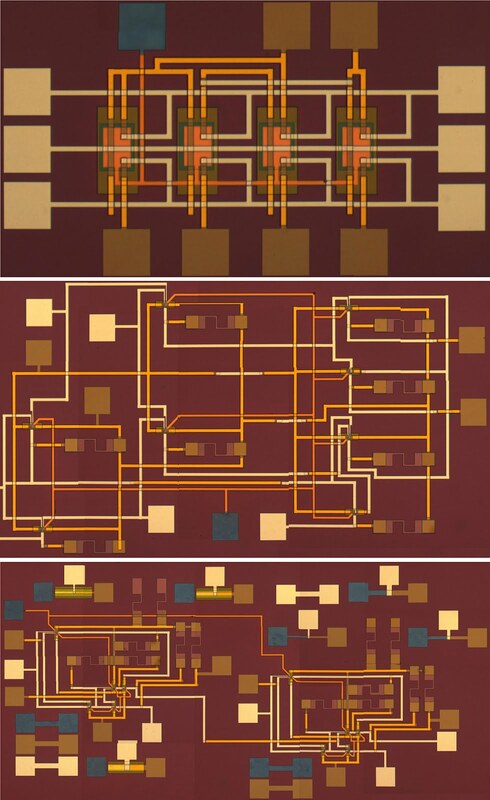 However, the same lack of electrical resistance that makes graphene attractive for some uses also makes it ill-suited for digital computing applications. Graphene conducts electricity so well because it doesn't have a band gap—an energetic threshold beneath which the material won't conduct electricity. This means that graphene can't be turned "off," and computers need "on" and "off" signals to transmit and process information. Because substrates slow the speed of electrons moving through graphene, Nikolai Klimov, a University of Maryland postdoctoral researcher working at NIST, suspended the graphene over shallow holes in a substrate of silicon dioxide—essentially making a set of graphene drumheads. To measure the graphene's properties, the team used a unique scanning probe microscope designed and built at NIST. When they began to probe the drumheads, they found that the graphene rose up to meet the tip of the microscope— a result of the van der Waals force, a weak electrical force that creates attraction between objects that are very close to each other, according to NIST scientist Nikolai Zhitenev and NIST fellow Joseph Stroscio. The researchers discovered that they could tune the strain in the drumhead using the conducting plate upon which the graphene and substrate were mounted to create a countervailing attraction and pull the drumhead down. In this way, they could pull the graphene into or out of the hole below it. And their measurements showed that changing the degree of strain changed the material's electrical properties. For instance, the group observed that when they pulled the graphene membrane into the tent-like shape, the region at the apex acted just like a quantum dot, a type of semiconductor in which electrons are confined to a small region of space. Creating semiconducting regions like quantum dots in graphene by modifying its shape might give scientists the best of both worlds: high speed and the band gap crucial to computing and other applications. According to Zhitenev, the electrons flow through graphene by following the segments of the hexagons. Stretching the hexagons lowers the energy near the apex of the tent-like shape and causes the electrons to move in closed, clover-shaped orbits—mimicking nearly exactly how the electrons would move in a vertically varied magnetic field. The work was a collaborative effort with the University of Maryland, College Park, and the Korea Research Institute of Standards and Science. 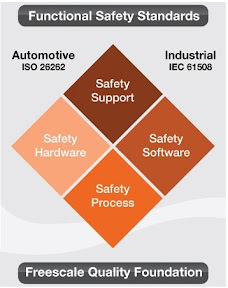 #SECURITY: "Freescale grapples with automotive safety mandates"
Here is what EETimes says about automotive safety standards: Automobile makers worldwide are grappling with meeting the safety standards set by the International Standards Organization (ISO 26262), which sets a high bar for automotive system failures that could cause injuries. Freescale Semiconductor aims to help auto makers meet the emerging safety mandate with a new system basic chip (SBC) which works hand-in-hand with its Power Architecture Qorivva MPC574x microcontrollers which provide a lock-step "checker" core to meet ISO 26262. From left: Freescale senior vice president Henri Richard leads panelists Warren East (ARM), Tony Belkin (Hospira), Greg Couch (National Instruments) and Jeremy Hammer (Ceton). Vendors defended the mass migration to ARM cores for their low-power, broad spectrum of performance levels and more economical software here at the Freescale Technology Forum (FTF) Tuesday (June 19). Freescale Senior Vice President Henri Richard's annual FTF panel discussion included ARM CEO Warren East, Tony Belkin, a director at medical-device maker director at Hospira Inc. (Lake Forest, Ill.), Greg Crouch, embedded systems business director at National Instruments Corp. (Austin, Texas) and Jeremy Hammer, chief technology officer at consumer electronics firm Ceton Corp. (Kirkland, Wash.) According to the panelists, consumerization favors ARM cores for next-generation applications, since they are lower power than traditional PC- and server-style processors, plus they are already running the software, in industrial and professional settings, that is currently being ported to the consumer setting. 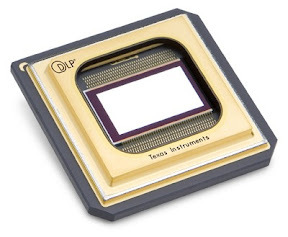 #DISPLAYS: "Next app for TI's DLP is large touchscreens"
Here is what EETimes says about 3D printing: Texas Instruments said this week it is adapting its HD digital light processor (DLP) chipset for rapid prototyping systems that can print 3-D objects. By optimizing the DLP for UV light, the surface of a receding photo-activated polymer can be formed into 3-D objects for custom and one-off precision manufacturing. UV-optimized DLPs are also used for exposing photo-active resists in pc boards with a virtual mask, laser repairs and computer-to-plate printing. Freescale Semiconductor Inc. is sampling the industry's first microcontroller to use ARM's ultra-low-power Cortex-M0+ processor, which aims to convert 8- and 16-bit applications to 32-bit status by offering one-third the energy consumption of 8-bit processors while delivering twice the performance of a 16-bit processor. 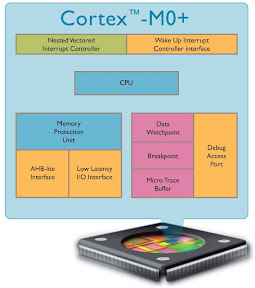 NXP is also a licensee for the Cortex-M0+ announced in March, but Freescale claims its Kinetis L series is sampling first, making it the "world’s most energy-efficient microcontroller," according to Freescale CEO Gregg Lowe, who will demonstrate it Tuesday (June 19) during his keynote presentation at the annual Freescale Technology Forum here. 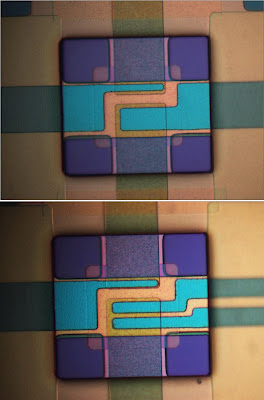 #MEMS: "Six-axis sensor fuses accelerometer with magnetometer"
Accelerometer and magnetometer data (left) is fused by embedded digital signal processor (DSP) functions (bottom) which conserves power in periods of inactivity. Digital e-compasses typically fuse data from a magentometer and accelerometer in order to accurately determine heading and orientation, enabling location-based services for navigation, gaming and augmented reality (AR). 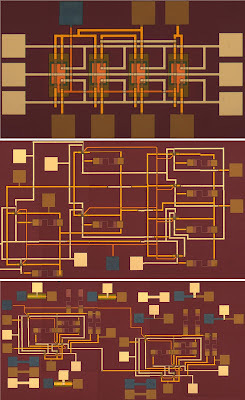 By housing its magnetometer and accelerometer in the same package with a digital signal processor (DSP), enabling higher accuracy sensor fusion, Freescale Semiconductor Inc. hopes to capture a bigger share of the $1.5 billion market for e-compasses forecast by ABI Research by 2016. #WIRELESS: "Motion Tracking Adds-on to Any Display"
Here is what Leap Motion says about its motion tracking technology: Leap Motion, the motion-control software and hardware company changing the future of human/computer interaction, today announced the Leap, the world's most accurate 3-D motion control device. It will change the way people control their laptops and desktop computers. The Leap is 200 times more sensitive than existing technologies and will cost a fraction of the price, just $69.99. Open today for pre-orders, the Leap will ship to consumers this winter. 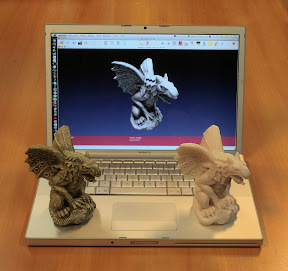 Leap Motion also has begun accepting requests for free developer kits today. Thousands will be provided in the coming months to let developers create a wide array of Leap-based applications. 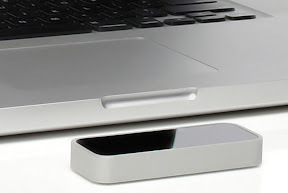 Developers who want to create Leap-compatible applications can request a Leap software development kit via Leap Motion's website at http://bit.ly/KrKMua. Leap Motion's app discovery platform will make it easy for developers to promote and monetize their own applications for the Leap. #COGNIZERS: "Consciousness Arises from Brain Synchronicity"
Here is what the Max Planck Institute says about consciousness: Consciousness is a selective process that allows only a part of the sensory input to reach awareness. But up to today it has yet to be clarified which areas of the brain are responsible for the content of conscious perception. Theofanis Panagiotaropoulos and his colleagues - researchers at the Max Planck Institute for Biological Cybernetics in Tübingen and University Pompeu Fabra in Barcelona - have now discovered that the content of consciousness is not localised in a unique cortical area, but is most likely an emergent property of global networks of neuronal populations. The question which parts of the brain are responsible for the things that reach our awareness is one of the main puzzles in neurobiology today. Previous research on the brains of primates has shown that neurons in primary and secondary cortices provide poor representation of visual consciousness. In contrast, the neurons in the temporal lobe seem to reliably reflect the actual conscious perception of a visual stimulus. These findings indicated that not all parts of the brain are responsible for the content of conscious awareness. 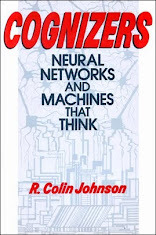 Nevertheless, the question whether only one of the brain's areas is responsible for the content of perception or whether more regions are involved in the process has so far remained unanswered. 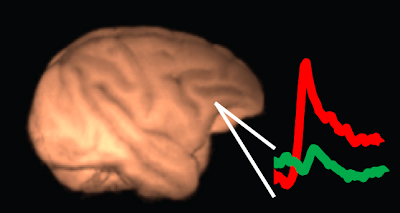 The Max Planck scientists in Tübingen led by Nikos Logothetis have now addressed this issue using electrophysiological methods to monitor the neural activity in the lateral prefrontal cortex of macaque monkeys during ambiguous visual stimulation. The visual stimuli used allow for multiple perceptual interpretations, even though the actual input remained the same. In doing so, Panagiotaropoulos and his team were able to show that the electrical activity monitored in the lateral prefrontal cortex correlates with what the macaque monkeys actually perceive. They thus concluded that visual awareness is not only reliably reflected in the temporal lobe, but also in the lateral prefrontal cortex of primates. The results depict that the neuronal correlates of consciousness are embedded in this area, which has a direct connection to premotor and motor areas of the brain, and is therefore able to directly affect motor output. These findings support the “frontal lobe hypothesis” of conscious visual perception established in 1995 by the researchers Crick (the co-discoverer of the structure of the DNA molecule) and Koch that awareness is related to neural activity with direct access to the planning stages of the brain. The results support this theory in so far as they show that the lateral prefrontal cortex is involved in the process of visual awareness. However, the fact that neural activity in two different cortical areas reflects conscious perception shows that the decision which sensory input reaches our awareness is most likely not made in a unique cortical area but, rather, that a global network of neurons from different areas of the brain is responsible for it. In the near future the group is going to record the electrical activity in both regions simultaneously. By this they will try to find out which of the two areas is activated first and draw conclusions on how the two areas interact with each other during conscious perception. This may lead to a better understanding of why only certain things reach our awareness and others remain suppressed. #MATERIALS: "Microfluidics to Cool 3-D Chip Stacks"
Here is what DARPA says about its IceCool program: The continued miniaturization and the increased density of components in today’s electronics have pushed heat generation and power dissipation to unprecedented levels. Current thermal management solutions, usually involving remote cooling, are unable to limit the temperature rise of today’s complex electronic components. Such remote cooling solutions, where heat must be conducted away from components before rejection to the air, add considerable weight and volume to electronic systems. The result is complex military systems that continue to grow in size and weight due to the inefficiencies of existing thermal management hardware. Recent advances of the DARPA Thermal Management Technologies (TMT) program enable a paradigm shift—better thermal management. DARPA’s Intrachip/Interchip Enhanced Cooling (ICECool) program seeks to crack the thermal management barrier and overcome the limitations of remote cooling. ICECool will explore ‘embedded’ thermal management by bringing microfluidic cooling inside the substrate, chip or package by including thermal management in the earliest stages of electronics design. Avram Bar-Cohen, DARPA program manager says the technique is similar to a radiator on a car that runs water through the engine block. #QUANTUM: "Physicists Say Quantum States Ubiquitous"
In the quantum optical laboratories at the Niels Bohr Institute, researchers have conducted experiments that show that light breaks with the classical physical principles. The studies show that light can have both an electrical and a magnetic field, but not at the same time. That is to say, light has quantum mechanical properties. Here is what the University of Copenhagen says about light having electrical or magnetic fields, but not both simultaneously: Researchers from the Niels Bohr Institute have made a simple experiment that demonstrates that nature violates common sense – the world is different than most people believe. 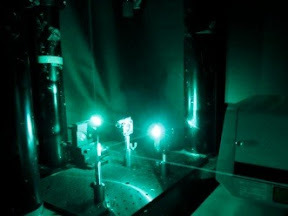 The experiment illustrates that light does not behave according to the principles of classical physics, but that light has quantum mechanical properties. The new method could be used to study whether other systems behave quantum mechanically. The results have been published in the scientific journal, Physical Review Letters. Eran Kot, a PhD-student in the research group of professor of quantum physics Anders S. Sørensen, maintains that systems possess measurable quantum properties, just like atomic particles. 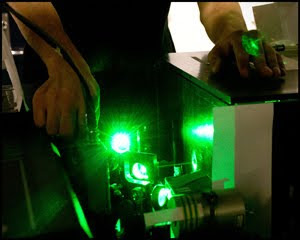 Based on a series of experiments in the quantum optics laboratories, the researchers examined the state of light. In classical physics, light possesses both an electric and a magnetic field. #MATERIALS: "3-D Block Co-Polymers Pattern Automatically"
Here is what MIT says about their block co-polymer self-assembly method: Researchers at MIT have found a new way of making complex three-dimensional structures using self-assembling polymer materials that form tiny wires and junctions. The work has the potential to usher in a new generation of microchips and other devices made up of submicroscopic features. Caroline Ross, the Toyota Professor of Materials Science and Engineering at MIT, says there has been “a lot of interest” among semiconductor researchers in finding ways to produce chip features that are much narrower than the wavelength of light — and hence narrower than what can be achieved using present light-based fabrication systems. She and her colleagues began by creating an array of tiny posts on a substrate of silicon; they then coated the surface with materials called block copolymers, which have a natural tendency to assemble into long cylindrical structures. By carefully controlling the initial spacing of the posts, Ross explains, the researchers were able to set the spacing, angles, bends and junctions of the cylinders that form on the surface. What’s more, she says, “Each of the two layers of cylinders can be independently controlled using these posts,” making it possible to create complex 3-D configurations. Amir Tavakkoli, a visiting graduate student from the National University of Singapore and lead author of the Science paper, says many researchers have tried to produce complex arrangements of nanoscale wires through self-assembly. But earlier attempts used complex processes with many steps, and had failed to control the resulting configurations well. The new system is simpler, according to MIT graduate student Kevin Gotrik. Psychologist Kevin Myers holding a rat trained to detect land mines in his lab at Bucknell University. Here is what Bucknell University says about it land-mine rats: Since the invention of land mines some seven centuries ago, activists, researchers and government officials have tried to root out the indiscriminant and deadly weapons with everything from metal detectors and robots to dogs, bees and rats. The methods have, however, proved dangerous, labor-intensive and time-consuming. Two Bucknell University professors are working with a U.S. Department of Defense contractor to develop faster and more sophisticated technology and methods to detect land mines. The team has devised a system to train rats to recognize and respond to the explosives, using materials that can be delivered anywhere with instructions that anyone can use. 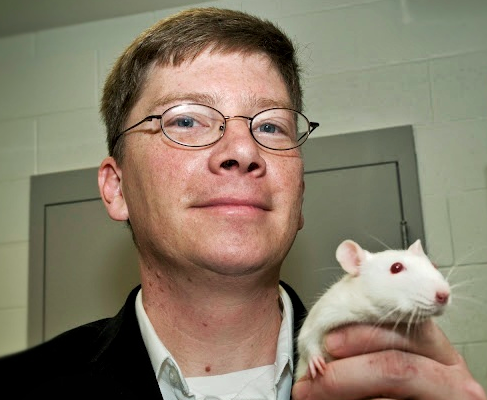 Kevin Myers, an associate professor of psychology uses learning, memory and motivation to train the rats. Together with Joe Tranquillo, associate professor of biomedical and electrical engineering, the team is working with Coherent Technical Services Inc. (CTSI). The U.S. Army Research Office has awarded the company and Bucknell $100,000 for Phase I of the project. Such contracts are designated for small businesses and academic research partnerships that address real problems with marketable technology. Land mines are especially dangerous because they are often buried then lay concealed for years. The International Campaign to Ban Landmines describes land mines as indiscriminate weapons that kill and injure thousand of people each year, instilling fear and serving as a barrier to development. The project is an "innovative yet low-tech solution" to address a problem in developing areas of the world, Myers said. The big advantage to training rats rather than larger animals is that the rats are small and light and do not trip the land mines, which can remain dangerous for years after they are installed. In his lab at Bucknell, Myers is training rats to respond to the scent of land mines by doing a simple task: turning in circles. The project is a combination of psychology, animal behavior and engineering, Myers said. Myers asked Tranquillo to collaborate with him on making the techniques easy for anyone to use. Tranquillo is working with student Matt Young Jr. in the University's new Richard J. Mooney Innovative Design Laboratory to develop the electrical, mechanical and thermal technology and software for the project. Graphic illustrations will provide users with step-by-step instructions on how to train and work with the rats in areas where land mines are present. 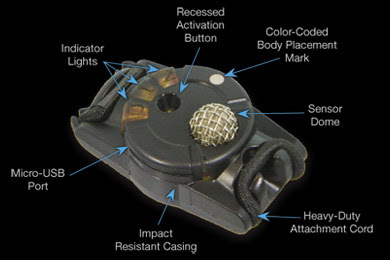 The rats will be outfitted with miniature backpacks and wireless transmitters that track their positions and movements. During the first part of their training, the rats learn to associate a mild buzz in the backpack – much like the "vibrate" setting in a cell phone--with getting a food reward. Eventually, the buzz itself acts as a reward that may be triggered when the rats complete certain tasks. In the next phase of training, the rats are prompted to sniff various odors and are rewarded for doing something specific in response, such as turning to the left rather than the right, when the land mine odor is present. Eventually, the rats learn to behave more distinctively when they detect that odor. If the project is successful, the contract could be extended for two years with an award of up to $750,000. In Phase II, the Army would provide support for recruiting private investors for the final phase, product development. E Ink smartcards let users input personal identification number to unlock information stored in the card. Here is what EETimes says about its E Ink's zero stand-by power displays: E Ink Corp. is branching out into a wide variety of reflective displays which it is showcased this week at the 2012 Society for Information Display (SID) conference. E Ink's Vizplex electrophoretic displays uses microcapsules containing white and black pigments that are attracted to the surface with electrical potentials to form paper-like white, black or grayscale pixels. Color versions use filters for red, green and blue. Most of E Ink's new displays, however, are monochrome models. The big advantage is that E Ink's displays require no power once information has been written. At SID, E Ink is highlighting a small display on the back of a smart card (see photo above). 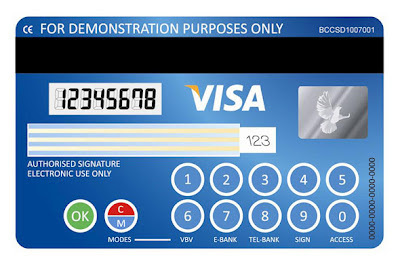 Users can enter a personal identification number which the small display will show along with anti-theft authentication codes and other information. The smart card is identical in size to a standard credit card including a battery with a three-year lifetime. E Ink also is showing an auxilliary display for smartphones to show status information without waking up the main LCD display. The auxilliary display is built into an iPhone case and shows time, battery power status and the number of pending messages and emails and works even when the phone is turned off. By converting the black back of the iPhone into an auxiliary display, battery life, waiting emails and messages can be displayed without having to enter a security code and turn on the main display. E Inks bike display shows speed as well as heart rate read through the handle grips. E Ink also has developed a traffic light that combines its reflective technology with conventional LEDs to create an ultra-low power signal that can be read under all lighting conditions. #MEMS: "Blast Gauge Monitors Soldier's Concussions"
#ENERGY: "Higher Efficiency Fuel Cells Demoed at National Lab"
Here is what PNNL says about its solid oxide fuel cell: Individual homes and entire neighborhoods could be powered with a new, small-scale solid oxide fuel cell system that achieves up to 57 percent efficiency, significantly higher than the 30 to 50 percent efficiencies previously reported for other solid oxide fuel cell systems of its size, according to a study published in this month's issue of Journal of Power Sources. 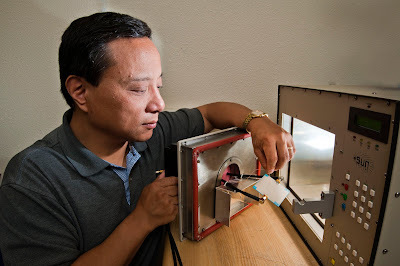 Knowing the advantages of smaller SOFC systems, the PNNL team wanted to design a small system that could be both more than 50 percent efficient and easily scaled up for distributed generation. 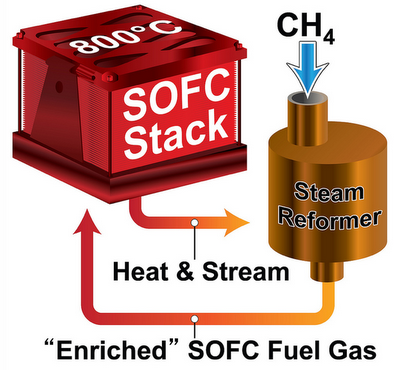 To do this, the team first used a process called external steam reforming. 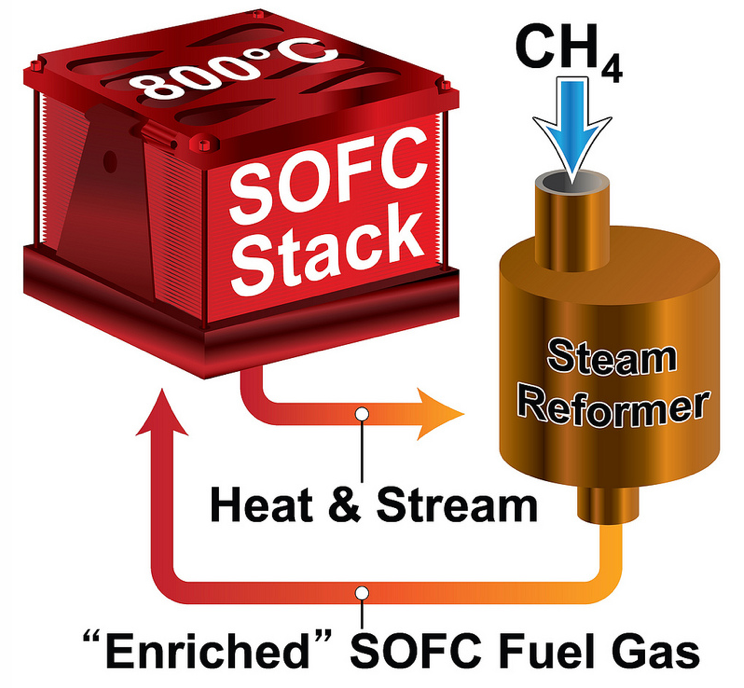 In general, steam reforming mixes steam with the fuel, leading the two to react and create intermediate products. The intermediates, carbon monoxide and hydrogen, then react with oxygen at the fuel cell's anode. Just as described in the below sidebar, this reaction generates electricity, as well as the byproducts steam and carbon dioxide. FindMyCarSmarter app works with a Bluetooth dongle to automatically remember where you parked your car, showing its location on a map. We’ve introduced a system that uses the Bluetooth Smart radio in the iPhone 4S to automatically mark your car's location whenever you park. Our app runs in the background so there is need to pull out and fidget with your phone each and every time you park. It’s almost magical the way your phone just knows where your car is parked. The only time you need to launch our app is after you've realized that you have lost your car, not before. We think this is a great usage of the technologies already in the iPhone leveraged to enhance people's lives. Find My Car Smarter helps people every day by saving time and reducing hassle in their already stressful lives. Since our Kickstarter funding we’ve gone through and revamped our user interface, added features like Dropbox syncing that allows users to view the parked location of a shared car, automatic parking metering & street sweeping alarms.